We all know mums are among the busiest people on the planet, so when I discover something that makes my life easier to manage I’m always really thrilled. That’s how I feel about Amex with Apple Pay – it’s a revolutionary new way to shop that means I can travel lighter and pay faster, so there’s no need to slow down my frantic day-to-day activities! I love working with Amex and here’s how they can make life easier for you too: you can use Apple Pay with your Amex card to purchase all the goodies and essentials that make up the things you’re passionate about. Whether it be food, fashion, books, makeup, clothing or household items, it’s all too easy. You don’t even need to take your wallet with you – all you need is your iPhone! So, not only do you get the convenience of paying with your phone, you can also earn rewards as you shop and enjoy a super-fast payment experience. Apple Pay makes my life so much easier in so many ways! First thing in the morning I used Apple Pay for a delicious latte after my usual walk along the beach – bliss! I just used my phone as I would my Amex card, and held it near the contactless terminal with my thumb on Touch ID. The payment was super quick and because it needs my thumb print to approve the transaction, it’s also very secure. Then it was time for a post workout green juice. No need for a bag or wallet, just my iPhone! Brilliant. Later in the afternoon I realised there was some last minute grocery shopping that I had to pick up after my errands – again, no need for a wallet! All I have with me is my car keys and phone! 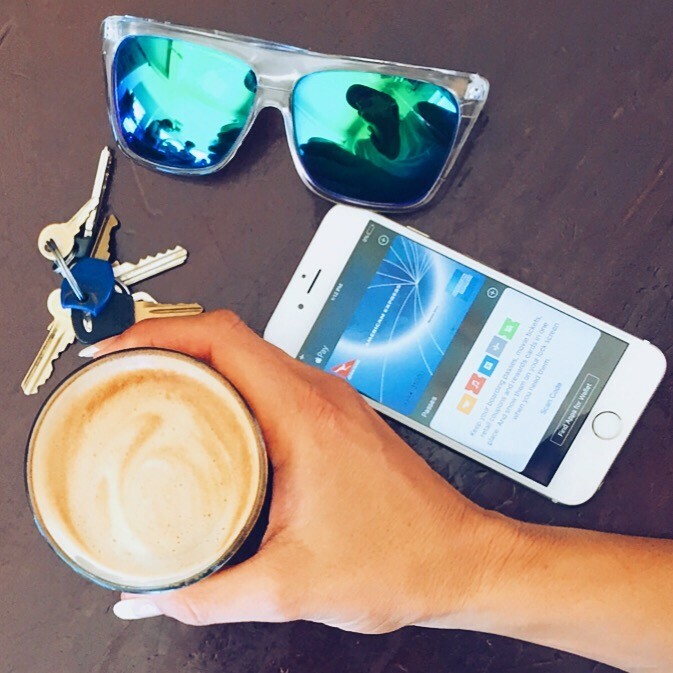 I’ve got my Amex loaded to Apple Pay wherever I go – it’s all too easy! So Amex with Apple Pay fits beautifully into my life, whether I’m on summer holidays playing on the beach with the kids, or having lunch in Byron Bay, grabbing groceries and other essential items, or treating myself to a green smoothie following a workout. The only items I need to grab as I leave the house in the morning are my keys and my iPhone. Payment is super-fast and - don’t forget - you’ll also receive special Amex Offers straight to your phone. These are are exclusive spend-and-get offers which you can save to your card with a single tap. You all know I would never tell you about any product unless I truly believed it made the lives of mums a lot easier – and Amex with Apple Pay has my whole-hearted approval. Thank you Amex and Apple Pay for making my life a whole lot more carefree! I’m sure there are many times in your own life where you need a helping hand, particularly for something we do almost every day – shopping. It’s all about convenience and utilising the technology that also keeps me connected to you! So wouldn’t you love your life just that little bit easier too?